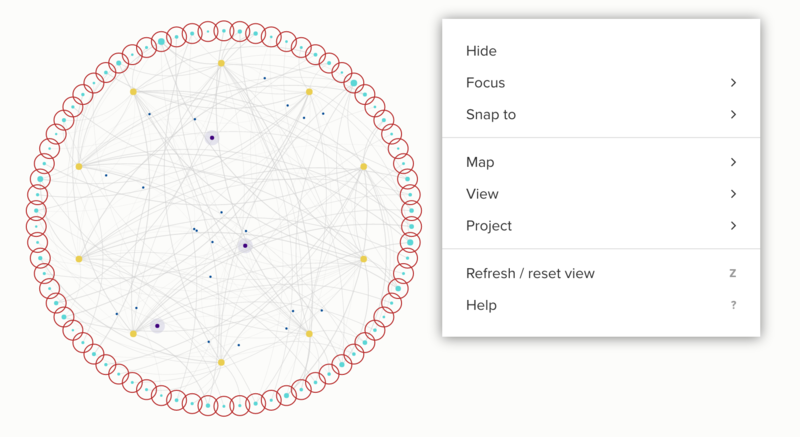 Snap-to makes it easy to arrange a group of elements as a circle or a line. This can be useful for creating rings of stakeholders based on whether they are core vs. periphery, positioning elements along a linear timeline, or just bringing more order to a complex map. It also brings additional grouping and sorting functionality to support analysis of complex data. To get started using snap-to, select one or more elements. You can do this by holding shift on your keyboard and dragging your mouse to draw a selection box over part of the map, or by clicking the search bar at the top of the map and then using the rocket icon to build a selector. After you&apos;ve selected multiple elements, right click the map and choose "snap to" from the menu. Then, you can choose whether you want to arrange the elements as a circle ("snap to circle") or a line ("snap to line"). Spacing. Once you&apos;ve chosen whether you are using a circle or a line, scroll on your mouse or trackpad to adjust the spacing of elements on the circle (creating a larger or smaller circle) or the line (creating a longer or shorter line). Angle (snap to line only). By default, lines will be drawn horizontally. If you&apos;d like to change the line to be vertical or any angle in between, hold shift and then scroll on your mouse or trackpad. You can tweak the ordering of elements in the circle or line by using the "group by" and "sort by" options. "Group by" allows you to group elements from matching categories together while "sort by" allows you to order elements from low to high based on numerical values. You can combine both to achieve sorted groups where the elements in each group are ordered from low to high. To group or sort, right click on the map again before hitting enter to save. You&apos;ll see an option for both "group by" and "sort by". It doesn&apos;t matter whether you choose to "group by" or "sort by" first. Simply pick one and then choose the relevant field from the menu. Once you&apos;re happy with how all the elements are positioned, hit enter to pin each element in place. If you&apos;d like to start over, hit esc. If you&apos;ve already saved the positions by hitting enter, you can always change the positions later by repeating these steps or unpinning the elements. Right click anywhere on the map and click "snap to" and then "snap to circle"
Press enter to save or esc to exit without saving. Right click anywhere on the map and click "snap to" and then "snap to line"